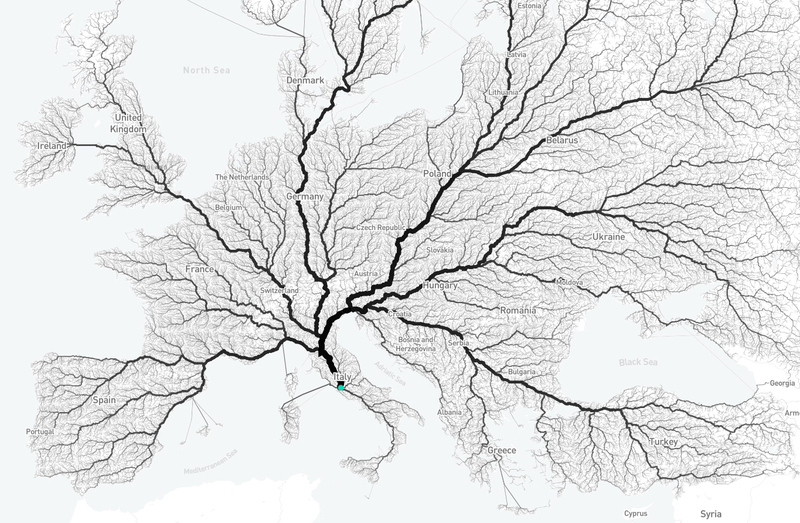 This beautiful map by Moovel Lab proves that all roads lead to Rome (click to enlarge). You can reach the eternal city on almost 500,000 routes from all across the continent. Which road would you take? The creators of the map aligned starting points in a 26,503,452 km² grid covering all of Europe, with every cell of this grid containing a starting point to a journey to Rome. Now that they had 486,713 starting points they needed to find out how Rome could be reached from them. For this they created an algorithm that calculated one route for every trip. The more often a specific single street segment was used, the stronger it is displayed on the map. The resulting map is somewhere between information visualization and data art, unveiling mobility on a very large scale. And it is so organic-looking, I first mistook it for a river system. Could it be that it follows the Fibonacci sequence? Technically all roads lead to everywhere.. but the map looks beautiful nevertheless. Actually i was 100% it was a drawing of a tree, and was about to throw away that fake – yet beautiul – picture until I realised it’s one of the most amazing thing i’ve seen. Great work. Very beautiful. But ancient Rome did not have links with Norway, for example, or Russia. Rome instead did have several links with Northern Africa, which is not rapresented on the map. I think that authors was thinking more to modern Europe, than to Roman Empire.